Title: Introducing Theological Interpretation of Scripture: Recovering a Christian Practice. One of the vexing aspects of engaging in the conversation about theological interpretation is the problem of definition. Scholars and theologians from varying backgrounds and disciplines are claiming "theological interpretation of Scripture,” while employing methods and producing results that span the interpretive grid. In Introducing Theological Interpretation of Scripture, Daniel Treier seeks “to tell the story and map the major themes of this movement” and also “to address some tough questions to clarify its future direction” (11). Treier defines the movement broadly as one that “seeks to reverse the dominance of historical criticism over a churchly reading of the Bible and to redefine the role of hermeneutics in theology” (14). Treier divides the book into two main sections. In part one, he charts the “catalysts and common themes” of the movement, which include an interest in precritical interpretation (chapter one), the possibility of a “ruled” reading which takes account of Christian doctrine (chapter two), and the role the community plays in discerning and arriving at meaning (chapter three). In part two, Treier delineates the areas where proponents of theological interpretation have sharp disagreements. These differences include the assumptions and positions involved in engaging biblical theology (chapter four), general hermeneutics (chapter five), and various social locations (chapter six). In this section, Treier asks if theological interpretation can bridge the gap between biblical studies and theological reflection, if secular theories of reading and interpretation have any bearing on biblical texts, and if interpreters of Scripture should be mindful of global social contexts. One notable feature of this book is the analysis of theological interpretation that Treier offers in a concluding chapter. Synthesizing his previous material, Treier asserts that theological interpretation uses the ideas of canon, creed, and culture to engage the Scriptures with and for the church. However, for Treier, the church does not participate in the theological process merely to take part in an informed discussion about the Bible. Rather, “the ultimate interpretive interest of the church is to know God in a holistic sense” (204). Theological interpretation seeks to utilize all the various “lenses” of literary and theological reflection in order to produce “a coherent vision of who God is and who that calls us to become in Christ” (203). Treier calls this perspective the “widest-angle lens” which puts the task of interpretation into proper focus (203). These perspectives also function as a map that guides the church on its pilgrimage to know and respond rightly to God. To illustrate this practice, Treier provides a sustained case study throughout the book concerning the “Image of God” (Imago Dei). In doing this, Treier relates the themes of each chapter to this doctrinal concept, and in the conclusion, he summarizes the role that exegesis, biblical theology, historical theology, systematic theology, and practical theology play in its full explication. For Treier, this “sketch” of theological reflection provides a “pattern for thought” that can guide the interpreter in his pursuit of “prayerful contemplation” (199). Thus, Treier engages in the process of theological interpretation even as he introduces the concepts. Some readers, though, might object to Treier’s framing of the issues, as even the ordering of an “introduction” involves debatable interpretive decisions. Others may also see a few gaps in the “prehistory” of the movement that Treier develops, though this is likely a feature of the introductory nature of the work rather than a result of oversight. A further concern relates to the chapter on globalization. Treier recognizes that while the other issues he treats “are frequently addressed at length by advocates of theological exegesis, globalization is not” (157). He quickly moves from this concession to an extended discussion of postcolonial thought and the rise of Pentecostalism in “the global south” (157). Because this emphasis is in some ways unique to Treier, readers would benefit from a more detailed discussion of its relevance and connection to the idea of theological interpretation, especially in light of Treier’s acknowledgement that “this chapter evokes more questions than answers” (182). One also notices Treier’s heavy reliance on the cultural analysis of Philip Jenkins. Nevertheless, Treier’s basic point in this chapter is well taken. As the Bible is being read, cherished, and interpreted in diverse contexts, “non-Western voices can no longer be marginal as they once were. We must listen” (186). This emphasis resonates with Treier’s similar interest in demonstrating the ecumenical benefit of a widespread return to the practice of theological interpretation (20-33). Through his clear structure and concise content, Treier achieves his aim of providing scholars, students, and pastors with a succinct introduction to this burgeoning movement. The two parts of the book quickly highlight the unity and significant diversity of the movement. Further, while Treier’s primary dialogue partners are the ones at the forefront of the theological interpretation movement (e.g., Stephen Fowl, Francis Watson, Kevin Vanhoozer), he also interacts with a wide range of related scholarship (e.g., the canonical approach of Brevard Childs and Christopher Seitz). In addition, Treier constantly references the Dictionary for Theological Interpretation of the Bible, thus making his study a fitting companion volume to this other important work in the field. Though Introducing Theological Interpretation appears early in the movement, it offers a contribution of definition and direction. 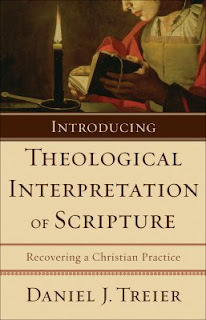 To borrow his own metaphors, Treier’s work can function as a set of lenses to bring the contours of this movement into focus and can serve as a roadmap to chart some of the trajectories the church and the academy will need to follow in order to recover the “Christian practice” of theological interpretation of Scripture. In SBJT 12.3 (Fall 2008), 111-12.